Big time college recruiting is out of control. Grown men now fawn over 17-year-old boys in ways that would make Chris Hansen blush. Is it any wonder these same kids grow up feeling entitled? There is no chance to feel entitled when your father is able to outshine even the brightest star. Such was the case at the press conference held recently by High School Senior Ray Lewis III held to announce his signing with the U of Miami. 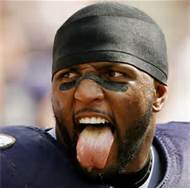 Yes *that* Ray Lewis the third. The young football phenom who scored 93 tds in high school and was signing with a major Division 1 program was predictable upstaged by pop. When asked about his son, Ray Lewis Senior replied. Heck of a job indeed. I suppose we should count ourselves lucky that he didn’t immediately break into his obnoxious game day dance right there while screaming “we must protect this house”. Pride and selfishness are two things that are easy to spot in others and hard to see in ourselves. Yet they can be very destructive character traits and must be dealt with proactively. But how? The bible tells us to submit to God and do all for His glory, but later warns against false humility. That is a tough line to tow sometimes. •	What does this look like in practice? Do any public figures practice this? •	How can we guard ourselves against selfishness and truly put others first? •	How can we check our motivations to ensure they are genuine? •	If Tim Tebow prays in an obnoxiously public way, is he truly glorifying God, or trying to make a spectacle of himself to ultimately glorify Tim Tebow? I think most big time professional athletes make their cake with endorsements more than salary. You can’t get an endorsement (outside of Mauer in MN) by being a quiet, team guy. The business of being an athlete is being a charicature of yourself to maximize the dollar. For many of these guys–particularly in the NFL–this is the only way they will make money their whole lives. If true, this is a sad statement about us as much as them. So it pays to be a poor-behaving, self-absorbed diva? Count me out. I’ll stick with the college game with all of its well behaved “student athletes”. Take a look at Luke 18:14. To paraphrase, those that exalt themselves will be humbled, and those that humble themselves will be exalted. I believe the best way to keep selfishness and pride in check is to surround ourselves with those that will keep us honest with our faith journey – brothers in Christ. Some might argue that is what wives are for . . .